Well, I seem to be on a bit of a roll here. Allow me to present my latest Remains of the Day type journal. The pages are again composed of Strathmore drawing paper, Rives Lightweight paper and hand-dyed watercolor papers. The pages are decorated with inked watercolor and drawing papers as well as some fabrics that coordinate with the cover. This journal is 6" x 9". And the Work Continues . . . It's been a busy few days in the studio! I'm still trying to get my Etsy shop stocked so I've been working on more Remains of the Day type of journals. 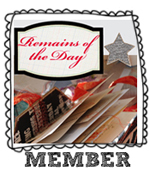 These aren't really true Remains of the Day journals the way Mary Ann Moss teaches in her online class. I am using Mary Ann's techniques for the covers; however, I have decided to make the pages with a more neutral character. So instead of sewing lots of fabrics and printed papers and ephemera onto the pages, I only added fabrics from the cover and some hand inked watercolor papers to the pages. I have also included some hand-dyed watercolor pages in the signatures. This way the journals can be used by anyone for any topic with out a predetermined style being force on them. Here's the first journal hot off the press! The cover is made from some upholstery fabric I found on the bargain table at JoAnn's and over-dyed to make it more interesting. It was as modern type of print with a cream/tan background. I was really pleased with the way the result. I pieced this with some silk scraps, yarns and other trims. The back of the cover. Here is one of the hand-dyed water color pages and a plain drawing paper page decorated with hand-inked watercolor paper. A close up of the free-motion stitching on the cover. The pictures don't do the colors justice. That green silk is a really great acid green and the silk right below it is a great orange sherbet color. It's really difficult to get complementary colors to photograph well together. Of course it probably doesn't help that the orange is one of those two-toned fabrics - you know, where the warp and the weft threads are different colors. I added beading to the ends of the binding threads to give it that extra bit of fun. I'm LOVING this journal!!!! NOTE: From now until March 31, 2011 I will donate 100% of all sales in my Etsy shop to the American Red Cross for Japan Earthquake and Pacific Tsanumi relief. Well, I've been busy working away in the studio now that my teaching is done for the semester. As a result, I've got a number of new items in my Etsy shop. Some of these are new designs and some are old favorites. I love making these and each one has her own unique personality. They are all handmade using hand-dyed cottons or commercial cottons. Arms, legs and heads are made from glass and/or wooden beads (all hand stitched). Hair is made of yarn. They are wild and crazy girlfriends! Finally, one of my new designs is a recycled denim heart which is hand beaded and hand embroidered and decorated with spray inks and acrylic paints. These can be worn as a pin or brooch . . .
. . . or as a pendant. Gotta go now - more work to do! Finally - New Work is Here!! Well, life has been relatively crazy lately with work and all so I haven't had the time to post any of my new work. I'm really excited about a new scrappy, Remains-of-the-Day- type of journal that I just posted in my Etsy shop. It's sort of a shabby chic design. The cover is made from recycled denim from old jeans, cotton batik, cotton twill, laces and trims. The cover has a hook and eye closure and a handmade denim and lace flower decorates the flap on the cover. There is a denim pocket on the inside of the front cover which would be great for keeping pens, pictures, ephemera or notes. The pages are made of a combination of Strathmore 80 lb. drawing paper and a few sheets of lightweight Rives paper. For added character the pages are of differing widths and heights. I decorated the pages with stitched-on laces, trims and watercolor and drawing papers which have been splatter painted with acrylic paints.